May 2011 Update: This project is now called the Joseph Arnold Lofts. View all related posts about this development. 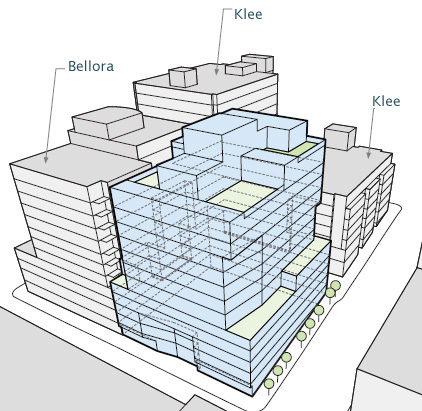 An early design review guidance meeting has been set for the 2700 Elliott Ave project (Elliott & Cedar), a proposed 13-story, 122-unit residential development in Belltown. The meeting will be held at Seattle City Hall on Tuesday, June 23rd at 5:30 PM in the Boards and Commissions Room L280. The 2700 Elliott Ave parcel was purchased last year by the Schuster Group, developer of Mosler Lofts, who indicated at the time a desire to develop the property with a “green” condominium building. Recently, they stated to the DJC they are pursuing the design process now in order to be ready for the next development cycle and market upswing. The parcel is situated adjacent to the Bellora and Klee Condominiums and a development proposal has been floating around since 2002 for this parcel, which has seen ownership changes in 2005 and 2008. 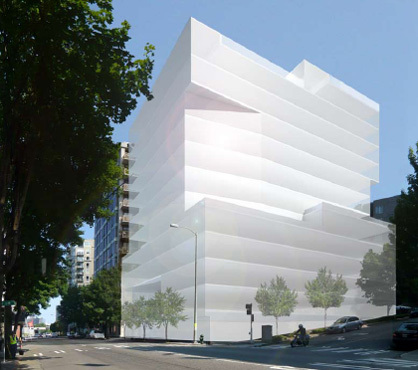 Back in 2005 a DPD decision regarding a 14-story, 107-unit proposal was issued to a representative of Trammell Crow Residential. The design proposal has been added to the Seattle DPD website and can be viewed here (PDF download). Renderings courtesy of LMN Architects.